So my boys have played football … soccer … lacrosse and also dabbled in rugby. In all those sports, the key defensive position (which a few of them played) was the blocker … this is key to the defense (and offense) in each of these sports. But, more appropos to what I do, the power of the block is even more critical. 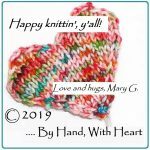 It is what makes lace knitting pop … allows fair-isle and other colorwork to have a smooth and professional-looking finish … it’s what makes a piece of knitting go from “just ok” to WOW! This is pretty. But it is “just ok” pretty. The knitting looks … heavy … especially the lace border. This is an ok piece of knitting. It would be striking with a black dress or shirt background … it would be fine. It would be “just ok”. Here is the same shawlette pinned out. 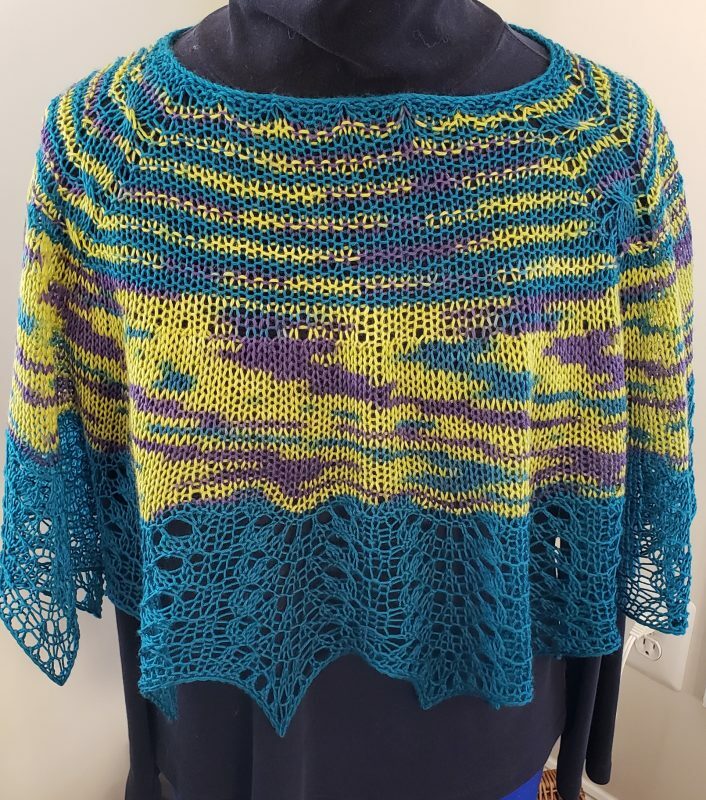 The stockinette section really shows the vortex of color-pooling quite nicely … the garter stripes smooth out and pop a bit … and the lace edge is ethereal in its lightness. So the shawlette has “grown” by 10 inches … and the opening has increased by 1 inch over the shoulders and 3.5 inches in width … which will make it a more comfortable garment to wear, with a flattering square (well, technically, rectangular) neck opening. This is what’s known as a firm blocking. “Firm blocking” occurs best (at least in my experience) with a natural fiber (or blend) that has been wet-blocked (soaked in cool water to which a touch of gentle soap has been added) to ensure that all the fibers are thoroughly saturated – I usually keep the garment in the cool-water for at least 30 minutes. Gently removing it from its bath and then rolling in a towel to get as much of the moisture out of the fibers. The just-damp knitted pieced in then pinned out firmly. I do this for all my lace knitting. I block all my other knitting less harshly … but still blocked (unless the yarn used is 100% man-made fibers .. these don’t have the elasticity that natural fibers have … so don’t waste your time blocking … it’s not going to do anything but give you a sopping mess!). And here is the final shawlette … off the blocking board/pins … and ready to wear. The lace is just as ethereal .. the pooling pops with bits of purple and teal against a chartreuse background … and the neck sits well with the garter-stripe uniting all. BTW, at rest (that is, off the blocking board), the shawlette “shrinks up” to 17.5 inches from neck edge to hem. This is because the yarn is no longer under the strain of the pins. But look how nice that soft scalloped edge from pre-blocking has now become a lovely wave with sharp crests. Gorgeous! I’ll be posting this pattern soon, so keep checking back. And, as always, enjoy the journey!